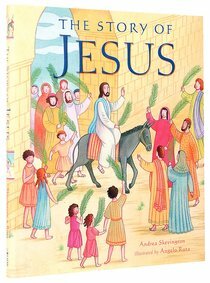 This beautifully written Bible storybook is a faithful retelling of Jesus' life, from the Annunciation to Pentecost. The text harmonises all four gospels, and is accompanied on every page by charming, warmly reverent illustrations. Ages 7-10. About "The Story of Jesus"
This book retells key episodes from the gospels simply and respectfully, andeaves them into a narrative that tells a compelling story from the birth ofesus to his death and resurrection. Within each episode, the retelling isaithful to one gospel version so that it is possible for the reader to begino understand the particular 'flavour' of each gospel. Readers will gain aetter appreciation of these four vital sources that tell us about Jesus'ife. Carefully referenced illustrations with informative captions and a mapf the Holy land set the gospel accounts firmly within 1st century history. Andrea Skevington studied English at Cambridge University and now lives in Suffolk, England, with her husband and two children. She tells stories to her own children and to others, through voluntary work in schools and as a Sunday-school leader.